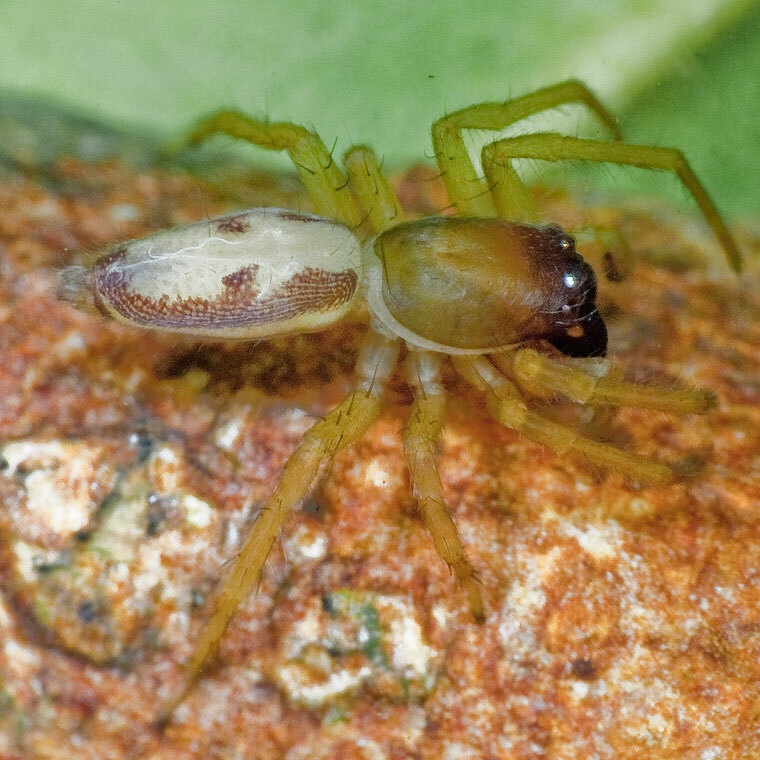 Clubionids are abundant and widespread in all Australian states and territories, including offshore islands and neighbouring countries, yet largely unknown and barely studied, probably because they are fast, nondescript spiders and many species seem very similar to each other. Clubionids occupy virtually all Australian habitats from rainforests to deserts, even beach zones. They can range from 4-30mm in body length and are generally pale to fawn or darker brown, sometimes with more or less strongly-marked, often purple patterns. They have 8 equally-sized eyes in two rows, the back row often wider, the front row straight or down-curved. The most obvious feature distinguishing most of them from other spider families is the forward-pointing appearance of their large and usually dark chelicerae or jaws. They tend to be slender with cigar-shaped, or slightly triangular abdomens, with a somewhat squared-off leading edge to a rectangular cephalothorax. Their conical spinnerets are usually obvious. Clubionids build a sac-like retreat on foliage or under bark and possibly in other crevices in debris or on the ground between or under stones. Some live in the dimples of spotted gums. The genus Cheiracanthium is placed by some in the family Miturgidae, but here we follow Deeleman-Reinhold and Raven in placing Cheiracanthium in the Clubionidae. For a long time most species in described Australian genera were in Clubiona and Cheiracanthium. Rainbow created amother genus in 1920 for a female on Lord Howe Island. More recently Pteroneta has been found in the northern tropics and Matidia in northern Australia and South East Queensland. Cheiracanthium is usually found on foliage, whereas Clubiona is usually associated with the persistent bark around the base of eucalypts or in other crevices and secret places. An intriguingly pattered Juvenile Clubiona sp. very small, about 3.5mm body length found in dry eucalypt acreage north west of Brisbane.